These simple but elegant soaps will be the hit for Valentine's Day. These will be a great addition to your holiday product line. To plastic beaker, add 1 oz. of cut up white soap. Add a sliver of Neon Hot Pink Soap Color Bar. Heat in microwave in 10 second intervals until melted. Spritz the inside of each mold cavity with rubbing alcohol. The alcohol helps the soap flow quickly, making it easier to fill in the details. 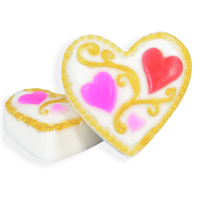 Using a plastic dropper, carefully fill the bottom heart of each cavity with opaque pink soap. Place the dropper into a cup of hot water to keep the soap flowing freely. Let soap harden. To another beaker, add 1 oz. of cut up clear soap. Add 0.05 oz. Neon Hot Pink Soap Color Bar. Heat in microwave in 10 second intervals until melted. Spritz the inside of each mold cavity with rubbing alcohol. 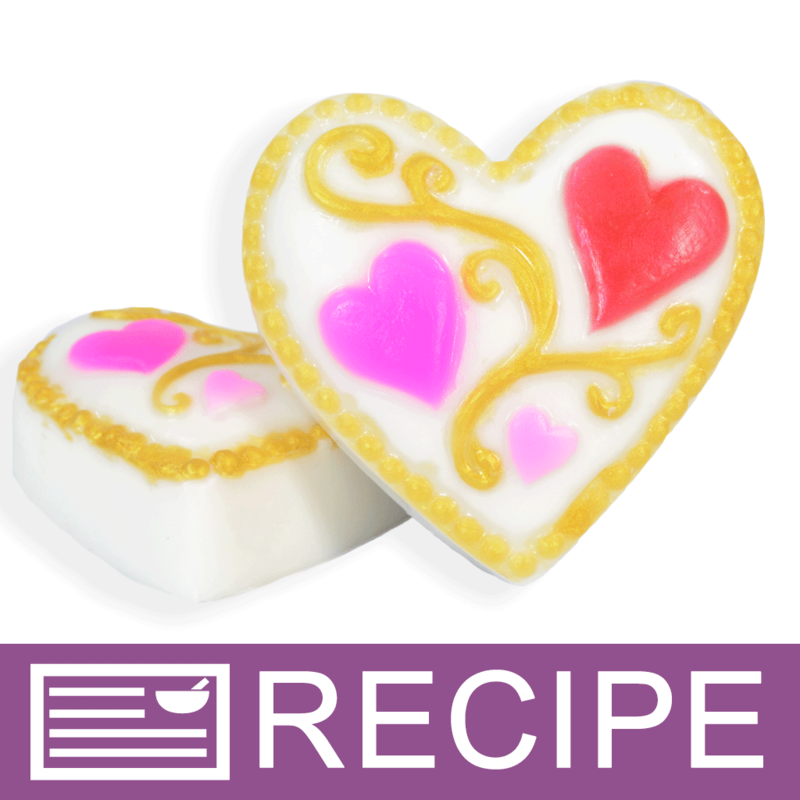 Using a plastic dropper, carefully fill the medium heart in each cavity with pink soap. Place the dropper into a cup of hot water to keep the soap flowing freely. Let soap harden. To a third beaker, add 1 oz. of cut up clear soap. Heat in microwave in 10 second intervals until melted. Add 3 micro scoops of NuTone Red powder. Stir to incorporate color into soap. Spritz the inside of each cavity with rubbing alcohol. Using a plastic dropper, carefully fill the largest heart with the red soap. Again, place the dropper into hot water. To last beaker, add 0.50 oz. cut up clear soap and 1/4 of the gold mica color bar. Heat in microwave just until melted. Spritz each cavity with alcohol then carefully fill the vines with the gold soap. Drizzle soap to fill the beading around the heart. Do not fill each individual dot with soap but keep the soap flowing together. This will help the soap pull away from the mold when unmolding the finished soaps. If necessary, reheat gold soap briefly and add more soap if needed. Once all soaps have been detailed, place mold in freezer for 20 minutes. This will help set everything in place. To a microwave-safe measuring cup, add 10 oz. of cut up white soap. Heat in microwave in 20 second intervals until melted. Add 0.30 oz. fragrance oil and stir. Spritz the cavities generously with alcohol. When the soap temperature cools to 130°F or lower, pour soap into each cavity filling to the top. Place in freezer for 30-45 minutes to completely set up. Carefully remove soap by turning mold upside down onto counter. Let sit for 15 minutes then gently push on the first soap until it releases. Repeat with the other soaps. 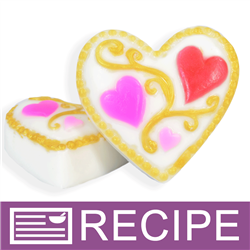 If any details remain in mold, reheat colored soap in beaker, spritz finished bar and carefully paint detail onto soap using a child's paintbrush. If desired, repeat above steps to make 3 more soaps. There should be enough pink and red color left over for detailing. Ingredient Label: Sorbitol, Coconut Oil, Propylene Glycol, Stearic Acid, Water, Sodium Hydroxide, Glycerin, Titanium Dioxide, Polyester-3, Red 28, Fluorphlogopite, Tin Dioxide, Iron Oxide.